NEW YORK — The disappointing Brooklyn Nets shook up their coaching staff Tuesday, reassigning top assistant Lawrence Frank to a non-bench role. Head coach Jason Kidd said Frank will not be at practices or games, and that he will be writing daily reports. He said the two had "different philosophies." 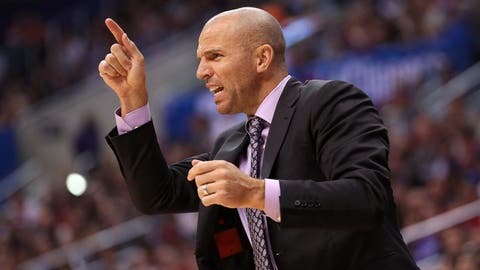 "This is a decision that I had to make and I made it and we move on," Kidd said. Kidd played for Frank with the Nets from 2000-2004 and hired him when he became a first-time coach in June. Frank had spent the two previous seasons as coach of the Detroit Pistons, and earned a league-high 21.4 percent of the vote as best assistant by executives who voted in the preseason NBA.com GM survey. "Different philosophies and that’s it," he said. "We’ll figure out how to stop people." Yahoo Sports’ Adrian Wojnarowski reported Tuesday that the relationship between Kidd and Frank deteriorated after Kidd ripped Frank in a staff meeting on Nov. 4. Wojnarowski reported Frank has a six-year agreement with Brooklyn â four coaching years â that averages more than $1 million a year. After the demotion, the Nets fell to 5-13 with a 111-87 loss to the Denver Nuggets, who are coached by Brian Shaw â the other finalist for the Nets job that went to Kidd. Shaw, a longtime successful assistant before finally getting his first head coaching opportunity this season, interviewed just after Kidd and said he thought he had a "pretty good chance" to be the Nets’ choice. "I think everything happens for a reason. Iâm happy in the situation that I’m in," Shaw said.